Lunch and Din ner don’t have to be the same old boring thing every day. Try playing with the foods and spices indicated on the Low Glycemic Alkaline Food List. Below are some suggested recipes to get you started, but feel free to make adjustments in order to create meals that accommodate your tastes. Please keep checking our website as we are continually adding new recipes and will be including notations on how to make the dish suitable for the low glycemic alkaline diet when appropriate. Left over dinner makes a perfect lunch for the next day. But if you are in need of something different, our recipe for Quinoa salad is very versatile. You can make it the night before and change up the recipe by varying the type of veggies and spices from the Low Glycemic Alkaline Food List. Every evening, we each enjoy a dinner plate-sized salad filled with a verity of greens, veggies and sprouts to compliment the main dish and sides. French Lentils – lentils are packed with protein, iron, magnesium, and potassium. Try our alkaline version of Vegan French Lentils. Suggested side dish: roasted vegetables, steamed broccoli, or another vegetable of your choice along with a large salad. Lentil Chili – chop 1 onion, 1 red bell pepper, 3 cloves of garlic, 1 celery stalk and saute in 2 tsp. coconut oil and 1Tbsp. water until onion is translucent. Add 2 cups dried green lentils, 1 tsp. sea salt, 4 cups water and spices (2 Tbsp. chili powder, 1½ tsp. cumin, 1 tsp. garlic granules, 1Tbsp. oregano, 1 large handful of chopped fresh cilantro, and cayenne pepper to taste). Cook on medium heat until boiling, then simmer until lentils are soft (approximately 1 hour). Serve over quinoa, millet or buckwheat*. Suggested side dish: roasted vegetables, steamed broccoli, or another vegetable of your choice along with a large salad. Lentil Soup – Try the alkaline variation of our recipe. Suggested side dish: sauteed greens over quinoa and a large salad. Millet Casserole – in a pot, measure 1 cup millet to 3 cups water, cover and cook on medium heat until boiling. (You may add spices of your choice or just cook plain with 1 tsp. of sea salt.) Then simmer on low until liquid is absorbed. Millet takes about 45 min to cook. Spread into an ungreased small casserole dish and top with pesto and finely chopped veggies and/or greens (Swiss chard, spinach, collards, kale, bokchoy) and bake at 350º until veggies are tender (approximately 30 – 45 minutes). Suggested side dish: steamed broccoli and a large salad. Millet Patties – mix into 2 cups of cooked millet the following: 1 Tbsp. basil, ½ tsp. dried thyme, ½ tsp. lemon zest, 1 Tbsp. olive oil, ¼ cup finely chopped onion, 1 clove garlic (chopped), ¼ finely chopped red bell pepper, and cayenne pepper to taste. With your hands, form into patties and bake at 350º until crispy on top. Dip into one of the snack dips or the Tahini dressing from the Falafel recipe. Suggested side dish: roasted vegetables, steamed broccoli, or sauteed greens along with a large salad. Minestrone Soup – is a delicious comfort food. Try the alkaline variation of our recipe. Suggested side dish: Millet or Vegetables Patties and a large salad. Roasted Veggies – try our Roasted Beets or Roasted Cauliflower with Garlic, Ginger and Turmeric recipes or just chop a mix of veggies from the Low Glycemic Food List and coat with olive oil, sea salt and a little cayenne. Place on a baking sheet and roast at 400º for 45 -60 minutes. Serve over quinoa, millet or buckwheat*. Suggested side dish: combine with one of the soups or lentil recipes from above and a large salad. Salad – this is a dinner staple. 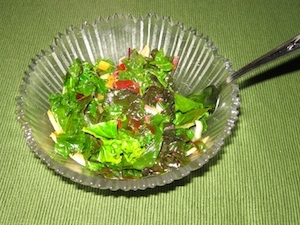 In a large bowl combine a variety of greens (arugula, chard, romaine lettuce, spinach) and add chopped chives and other veggies from the Low Glycemic Alkaline Food List. Change up the dressing to make it interesting. Add a little water to the guacamole recipe (see snacks) to create a creamy dressing or try adding different spices on the Low Glycemic Alkaline Food List to 1 part apple cider vinegar/3 parts olive oil mixture. Make sure to always have an avocado with your salad, as it is a wonderful source of healthy fats. Sprouts are powerhouse of nutrients and a great addition to your salads! Through the process of sprouting, the seeds increase their bioavailability of protein, vitamins and minerals, providing excellent quality, easily absorbed nutrients in an array of vitamins, minerals and anti-oxidants. You can purchase the seeds online or at your local health food store. Learn more about sprouting. Sautéed Greens – packed full with antioxidants, beta-carotene, glucosinolates, and lutein, greens are an essential ant-cancer food and a must at least 3 times a week. Try our recipe. Serve as a side or a main course over quinoa, millet or buckwheat*. Split Pea Soup – this alkaline soup posted on Clean Green Simple’s website is one of our favorites and it’s so easy to make! Split peas are high in protein, magnesium, iron, B-6, and potassium. Serve with millet patties; they taste great dipped into the soup. Also serve with a vegetable side dish of your choice and a large salad. Stir Fry Veggies with or without Tofu – sauteing veggies and tofu is a quick easy meal that allows a lot of room for variety. Chop vegetables of your choice from the Low Glycemic Alkaline Food List and saute in the spices of your choice. (See suggested spice combinations at the end of this section). Serve over quinoa, millet or buckwheat* with a large salad. Vegetable Patties – experiment making different kinds of vegetable patties. Try our Falafel Patties, just omit the pita bread and serve over quinoa, millet, or buckwheat*. Or try these Vegan Lentil Burgers but substitute cooked millet or raw oats for the breadcrumbs and almonds or sunflower seeds for the walnuts. Serve with a side of sauteed greens and a large salad. * Buckwheat Cooking Tips: Buckwheat is a fruit seed rich in flavonoids (phytonutrients that help protect your body from disease). High in protein, magnesium, vitamin B-6, iron and potassium, it is a powerhouse of nutrients. However, Buckwheat has a very distinct earthy flavor. If you prefer to lesson its intensity, squeeze ½ lemon into the water before cooking. It also takes almost double the amount of spices in order to impart flavors. Here is some information on different cooking methods. Below are some suggested spice combinations from the Low Glycemic Alkaline Food List. Have fun finding the combinations you enjoy.